Add a ‘third dimension’ to your card! 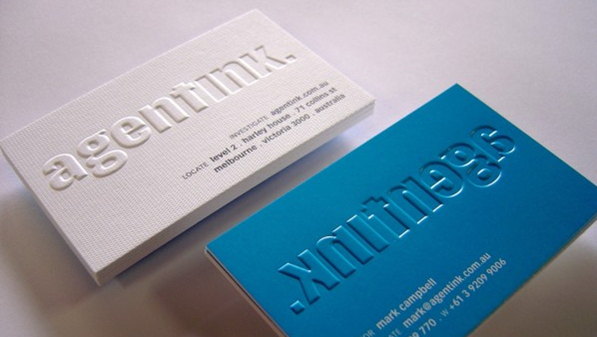 Embossed business cards have a striking and bold 3- dimensional look & feel. The surface of the paper is raised by pressing from the reverse side of the paper, which add a touch of class and texture for grabbing attention and leave a deep impression. Blind Press Embossing: embossing only over the paper. An embossed image that is not stamped over a printed image, not foil stamped, and the resulting raised image is the same color as the paper is blind embossing. Ink Embossing: print with ink first and embossing applied over. Embossing applied to a printed image. It refers to embossing over ink. * 1. 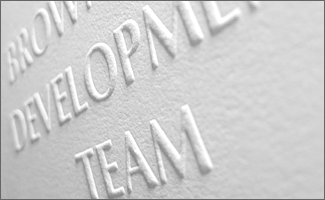 Larger than size of 20mm x20mm or multiple areas must be custom quoted at : info@boostprint.com.au The prices on our website only include embossing area within 2cm(width)x2cm(height). * 2. If we do the embossing on the front side, it will affect the back of the card. The embossed part can be seen from the other side as well, like debossed. Please note: for the technical limitation during the embossing process, there is a unavoidable offsetting (up to 1mm) to any direction from your design. So we don't reccomend to do ink embossing on small text and thin lines, just a little shifting will cause the embossing can't sit on the text at all and ruin your design. And 7daysprint will not be liable for the reasonable offsetting. 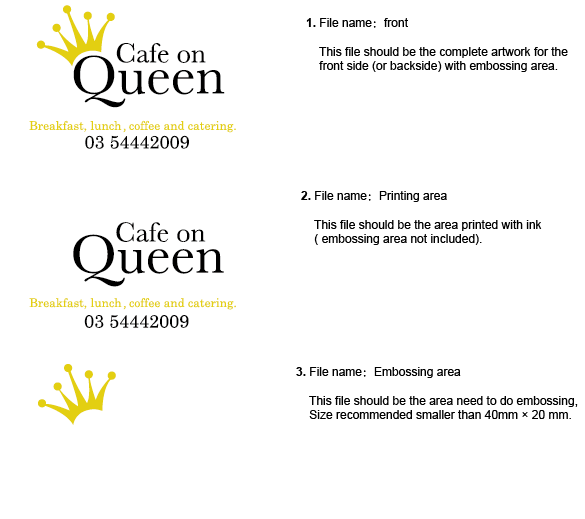 For the file preparation of the Embossing area on the business cards, you need to submit extra documents as below (file 01,file02 , file03). JPG file is not acceptable, Vector Graphic Files is preferrd- vector-based images can be scaled by any amount without degrading quality. Usually supplied in PDF, AI, EPS or CDR formats. Colours set to CMYK, All images in your artwork are 300dpi when placed at 100%, All fonts are outlined (converted to curves) or embedded.Example for embossing: do embossing on the logo.